We all know that substances such as acids and alkalis or articles such as a stick of dynamite, radioactive transport are dangerous; however, it may not occur to us why a substance like paint or ink may be dangerous. From the point of view of moving or shipping these items around the world safely it is essential that these dangers are recognized and understood. 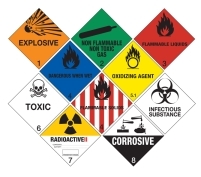 To overcome this, the United Nations decided to categorize dangerous goods according to their major danger and identified nine classes. These are substances, that when initiated, undergo rapid expansion producing light, heat, sound and pressure. TNT, Dynamite, Fireworks, Bullets, Grenades and Flares all fall into this class. Since gases are carried under pressure for the purposes of transport in order to reduce their volume, this in itself presents a danger. Pressurized articles can cause significant damage should the method of containment be compromised. If the contents are flammable and or toxic as well, the danger is increased dramatically. By far the largest class in terms of tonnage moved throughout the world, it includes many familiar everyday items such as paint, ink, alcohol, adhesives, petrol and diesel. The term flammable liquid is self-explanatory but can be a little misleading in that these are liquids that give of vapour that is readily combustible. 4.1 Flammable Solids – These are solids that are flammable. Firelighters for example (naphthalene) are found in this class. 4.2 Spontaneously combustible substances – will catch fire if they come into contact with air. 4.3 Dangerous when wet substances – will catch fire if they come into contact with water or even moisture in the air. 5.1 Oxidizing Substances – These contain high levels of oxygen and will support a fire even without the presence of air. 5.2 Organic Peroxides – Unstable man-made substances with high levels of oxygen. Usually subject to temperature control. 6.1 Toxic Substances – Poisons that can cause short or long-term harm or even death if they enter the body. 6.2 Infectious substances – Living organisms that can cause disease and death if they enter the body or the atmosphere. Material said to be radioactive is essentially unstable and contains more particles than it should. It therefore breaks down or decays structurally by emitting particles or waves in the form of radiation. This radiation can in turn affect other material. Will chemically break down or corrode other materials such as concrete, metals, wood, rubber and human tissue! Acids and alkalis are examples of this. Items in this class do not readily fit the criteria of other classes but do exhibit some traits or are dangerous for other reasons. The dangers can vary dramatically. Here at Connection Couriers we not only carry all classes of dangerous goods but you can also learn how to carry them by attending one of our ADR training courses at our approved independent training centre.